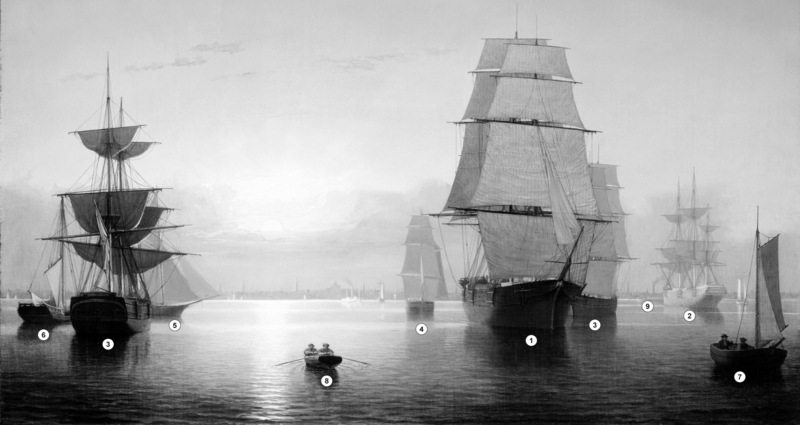 Boston Harbor was a regular subject for Lane from at least 1847 through the late 1850s. It was an obvious subject for the marine painter who had lived and worked in various lithography studios overlooking the harbor and whose first Boston patrons were all involved in the maritime trades. The range of Lane’s Boston Harbor works over the years is fascinating. (See Earl A. Powell’s essay “The Boston Harbor Pictures” and, for example, Boston Harbor, 1856 (inv. 203) and Harbor of Boston, with the City in the Distance, c.1846–47 (inv. 88).) The influence of Robert Salmon is particularly strong in the early works, which are typically crowded scenes of intense activity, with the wind, clouds, and waves creating repeating patterns of movement that show the energy and ambition of the great port at its peak. This painting, owned by the Los Angeles County Museum of Art (LACMA), and its companion Boston Harbor, c.1850 (inv. 48) at the Museum of Fine Arts Boston (MFA) must be treated together as they are fully developed variants on the same composition. They create a very different impression than Lane’s earlier Boston Harbor works. Here the subject is the hanging moment between day and night, between wind and calm, light and shadow, sails set and furled, boats entering and leaving, the enormity of the vessels and the smallness of man. Lane is in full mastery of his medium. In conception and execution these paintings go well beyond his previous harbor scenes. He has transformed a typical genre subject of vessels in a crowded harbor into poems of stillness, silence, and light, all hung on the geometric armature of the magnificent vessels and their alignment to the sun setting over the still harbor. Lane has taken the view as if one is low on the water in a small boat just behind the two men rowing into the path of the sunset, emphasizing the sheer mass of the great hulls and soaring height of sails and spars looming over them. The ships have seemingly transformed into enormous sentient beings of a mute order as they align themselves along a processional corridor, parting to let the rays of the setting sun reflect off the water and fill the viewer’s field of vision. The two paintings need to be seen together to appreciate the extent of Lane’s mastery of the subtle variations of sunset color and reflection in the two works, one keyed in shades of blue and yellow, the other in pinks, oranges, and browns. Also compare the organization of the great full-rigged merchant and packet ships that dominate the composition. In the MFA painting the ship on the right is facing the sunset, and the brig on the left with all sails set is facing the viewer. In the LACMA painting the order has been reversed, though they are different ships. Note also the ship on the right has all sails set, and the ship’s sails on the left are partially furled, another reversal of the MFA painting. In both paintings there are a surprising number of vessels (more in the MFA picture), yet both paintings feel spacious and almost empty in the reverential calm and order they evoke. Both paintings can be dated sometime after 1853 as that was the year the steeple of the First Baptist Church was completed, shown just to the right of the State House dome on the horizon. The paintings were probably not done as companions for a single buyer as they are of a slightly different size. However, it’s hard to imagine Lane didn’t have both in his studio at the same time as he fully engaged in the variations on his theme. This author’s guess is he did the MFA painting first with its greater number of vessels, particularly those in the foreground. Following the reductive theme we see over Lane’s whole career, he then reduced the vessel numbers, simplified the foreground, and emphasized the direction of the composition by having the rowers align to the sunset. Note the vessel on the very far left in the MFA picture is angled away from the sunset; in the LACMA picture it is now pointed towards the sunset. Also note how Lane has tilted the lower yard arm of the far left vessel in the LACMA picture, creating a tension not present in the strict horizontals of the yard arms in the MFA work. The flawless palette shift to a dominant blue and yellow in the LACMA painting from the pinks and oranges of the MFA work is a further example of Lane’s full engagement and mastery of his medium. He is never content to copy but is always pushing the boundary of what he could do with a scene, here with extraordinary effect. Showing Lane's neighborhood while working in Boston. Lane had studios at the intersection of Washington and State Streets, Summer, Tremont and School Streets. Map at front of almanac with Tremont Temple highlighted. American Scenery by N.P. Willis, Esq. During the years after the war of 1812 and before the Civil War, the port of Boston was a center of American deep-water shipping. Trading with China, India, and the West Indies, which had fueled maritime growth in the early years of the century gave way to re-exporting these goods and foreign trade based on the shoe and textile trades. Although second to New York in terms of shipping tonnage, many of New York's shipbuilders and merchants were Boston based. In addition, ship building continued in Boston. Also, the coastal trade (the domestic trade up and down the coast) was still the most efficient way to transport goods and passengers, and accounts for much of the tonnage and shipping traffic. W.H. Bunting, Portrait of a Port, Boston 1852-1914 Cambridge: The Belknap Press of Harvard University, 1971. 14 1/2 x 18 in. 26 1/4 x 41 in. United States Naval Academy Museum, Annapolis, Md. For digitized version, click here. 17 1/4 x 24 7/8 in. American Antiquarian Society, Worcester, Mass. 13 7/8 x 22 3/8 in. From Sally Pierce and Catharina Slautterback, Boston Lithography, 1825–1880: The Boston Atheneaum Collection (Boston: Athenaeum, 1991): "Tidd drew this print when he was a consulting engineer for Simpson's. He has depicted the clipper ship 'Southern Cross' in the dry dock. Built in 1851, she was known for having sailed from San Francisco to Hong Kong in the record breaking time of thirty-two days. The Bethlehem Ship Building Company eventually took over this location and operated a dry dock there until the mid 1940s." The "Britannia" steamship leaving Boston, U.S.
U.S. Coast Pilot, Atlantic Coast Part 3. Government Printing Office, Washington, D.C. Detail of Coast Pilot chart showing Point Allerton. Boston : Published by Whitefield and Smith, 1848. 1 print : lithograph, tinted ; image 50.3 x 111.9 cm., 68.7 x 121.2 cm. View of the city of Boston from East Boston showing Boston Harbor. The wharves of East Boston can be seen in the foreground. Number nine of thirty-eight city views published in "Whitefield's Original Views of (North) American Cities (Scenery). On stone by Charles W. Burton after a drawing by Edwin Whitefield. Inscribed in brown ink lower right corner of sheet: "Boston Athenaeum from Josiah Quincy. September 28, 1848." The "new" State House is located across from the Boston Common on the top of Beacon Hill, and serves as the Massachusetts state capital. The land was once owned by Massachusetts's first elected governor, John Hancock. Charles Bullfinch was the architect of the building, which was completed in 1798. The dome was originally roofed with wood shingles, which leaked. In 1802 it was covered with copper by Paul Revere's Revere Copper Company. The dome was first painted gray and then light yellow before being gilded with gold leaf in 1874. Other Whitehall boats appear in the foregrounds of Boston and other unidentified major port scenes (see New England Harbor at Sunrise, c.1850 (inv. 27), Brig "Antelope" in Boston Harbor, 1863 (inv. 43), The "Britannia" Entering Boston Harbor, 1848 (inv. 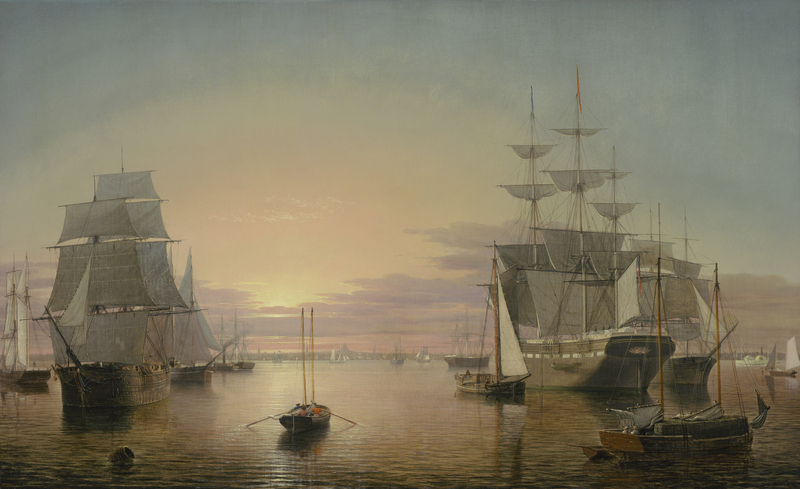 49), Boston Harbor, Sunset, 1850–55 (inv. 242), The "Constitution" in Boston Harbor, c.1848–49 (inv. 243), and Clipper Ship "Southern Cross" in Boston Harbor, 1851 (inv. 253)). 1. Howard I. Chapelle, American Small Sailing Craft (New York: W.W. Norton & Co., 1951), 195–96. Robert Salmon was born in Whitehaven, Cumberland, England as Robert Salomon in 1775. He spent his early years working in England specializing in marine art. He then emigrated to Boston in 1828. He prospered in the Boston art scene and quickly became a prominent artist. In 1842 he left Boston and returned to Europe where he painted until 1845. John Wilmerding, Robert Salmon: Painter of Ship & Shore. Salem: Peabody Museum. In this article, a moonlight view of the harbor of Cape Ann by Lane is described in detail by a viewer and his skill in depicting the Cape Ann coastline is praised. Lane's associates, Salmon and Birch, are mentioned, but as comparisons to Lane. "Those who visited his room, were highly pleased with the skill he manifested in portraying the beauties of our coast." "-Mr. Lane, the distinguished painter of marine views, is in town on a flying visit. Lane is a resident of Gloucester in this State. Since Salmon's death, we have no one, who can paint a ship and an ocean prospect like him. His "squalls at sea" are the best things of the kind, that we remember to have seen." "The Boston Transcript, speaking of our fellow townsman Lane, says: - 'Since Salmon's death, we have no one, who can paint a ship and an ocean prospect like him. His "squalls at sea" are the best things of the kind, that we remember to have seen.'" "...It was my good fortune, in the company of a few friends, to visit Mr. Lane's studio where are several fine paintings. Among these were a night scene, with the full moon shining upon the dark tranquil waters with a fire in the distance, which uniting with the soft rays of the moon gave it a most delightful effect. Also a view of Boston with its magnificent harbor, on which are many fine vessels, steamboats, &c. The picture represents a beautiful, calm day, with many fine craft all ready for sea, with their graceful shadows reflected so life-like in the waters, that one feels he too is standing on board, will soon be moving on that expanse which Mr. Lane has made so delightfully placid, that even the greatest coward would be allured into a sea voyage. May he long live to gladden the world with his precious gifts, and enjoy his delightful home which refined tastes are beautifying. His residence commands one of the finest water prospects in town. Standing upon the threshold of his delightful home, we witnessed one of those glorious sunsets which can only be seen in our New England Springs, and as we looked abroad, my friend remarked,"truly, Mr. L. has made the waste places glad." –LOUISE. 11 x 7 1/4 in. U.S. Navy Yard, Charleston, Mass. Mrs. Malcolm E. (Helen Miller) Smith and Mrs. William (Katherine C. Miller) Hoffman, Rhineback, N.Y.
1965 Metropolitan Museum of Art: The Metropolitan Museum of Art, New York, New York, Three Centuries of American Painting, collection of Mr. and Mrs. Bronson Trevor. 1981–82 National Gallery of Art: National Gallery of Art, Washington, District of Columbia, An American Perspective: Nineteenth-Century Art from the Collection of Jo Ann and Julian Ganz, Jr.
1983–84 Museum of Fine Arts: Museum of Fine Arts, Boston, Massachusetts, A New World: Masterpieces of American Painting, 1760–1910. 1988 National Gallery of Art: National Gallery of Art, Washington, District of Columbia, Paintings by Fitz Hugh Lane, no. 25, ill. in color, 50, as Boston Harbor at Sunset. 1990 Hirschl & Adler: Hirschl & Adler Galleries, New York, Counterpoint: Two Centuries of American Masters, as Boston Harbor, Sunset. Wilmerding 1964: Fitz Hugh Lane, 1804–1865: American Marine Painter, no. 21, p. 55. Feld 1965: "Loan Collection," ill., p. 289. Wilmerding 1971a: Fitz Hugh Lane, p. 75. Antiques 1982: "An American Perspective: Nineteenth Century Art from the Collection of Jo Ann and Julian Ganz Jr.," ill., p. 260. Le Monde 1984: "America in Paris." Time 1984: ill., p. 65. Alexander Gallery 1985: The Water's Edge. Art News 1985: p. 98. Metropolitan Museum of Art 1987: American Paradise: The World of the Hudson River School, fig. 110, ill., p. 17, text, p. 17. Wilmerding 1987: American Marine Painting, fig. 106, ill., p. 116, text, p. 118. Addams Allen 1988: "A Luminary Among Luminists." Dorsey 1988: "Lithographer to Luminist." Kane 1988: "Paintings by Fitz Hugh Lane," ill., p. 75, text, pp. 1, 74–75. Wilson 1988: "A Breath of Fresh Light on Yankee Capitalism." Kelly 1988a: "The Paintings of Fitz Hugh Lane," ills., cover and pl. X, p. 125, text, p. 119. Wilmerding 1988a: Paintings by Fitz Hugh Lane, no. 25, ills. in color, pp. 46 (detail), 50, as Boston Harbor at Sunset. Hirschl & Adler Galleries 1990: Counterpoint: Two Centuries of American Masters, ill., p. 15, text, pp. 14–15. Munchnic 1990: "A Delicate Courtship," ill., text, pp. 94–95. Saint Louis Art Museum 1990: George Caleb Bingham, pp. 178, 180, 188 (n. 100). Wilson 1990a: "Watching LACMA Grow," p. 91. Wilson 1990b: "A World of Philanthrophy," p. F22. Wilmerding 1991: American Views: Essays on American Art, pl. 14, ill. in color, p.157, fig. 113, p. 174, text, pp. 102, 174, 190, 339 (n. 10). Gaehtgens and Ickstadt 1992: American Icons: Transatlantic Perspectives on Eighteenth- and Nineteenth-Century American Art, p. 72. Novak 1992: "Self, Time, and Object in American Art: Copley, Lane and Homer," no. 4, ill., p. 72, text, pp. 71, 80. Davis 1993b: "Fitz Hugh Lane and John Gadsby Chapman's American Drawing Book," p. 707. Citation: "Boston Harbor, Sunset, 1850–55 (inv. 242)." Fitz Henry Lane Online. Cape Ann Museum. http://fitzhenrylaneonline.org/catalog/entry.php?id=242 (accessed April 19, 2019). Record last updated June 9, 2016. Please note that the information on this and all pages is periodically reviewed and subject to change.